Under the current trend of computing and networking, data centers play the centralized role to collect and process the big data in the cloud. Since there is a crucial need for using extension “jumper” power cords for inter-rack PDU, Pactech launched a full set of commonly used IEC 60320 jumper power cords as today’s data center solutions. IEC 60320 is a set of standards from International Electrotechnical Commission (IEC) specifying power cords appliances up to 250 volts (more information can be found here https://en.wikipedia.org/wiki/IEC_60320 ). While the maximum rated current of IEC 60320 cannot exceed 16 Amp internationally, the region of North America has approved the use of a higher capacity of current not exceeding 20 Amp. 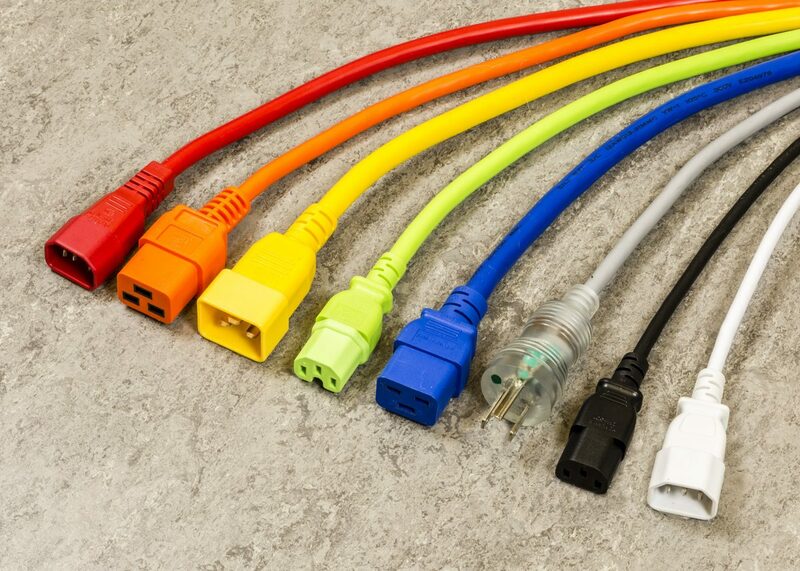 When choosing the exact types of jumper power cord for either connecting the power distribution unit (PDU) to servers or between the equipment, there are 5 points of consideration: the geographical location of use, the plug and connector type, the length, the color, and the customization availability. Pactech guarantees our customers’ confidence by delivering the correct data center power cords to meet the customers’ exact requirements. Regulatory bodies in different countries have their own standards of approval for the use of power cords. For example, in the U.S. market, Underwriters Laboratories Inc. (UL) completes the portfolio of electrical products in the United States with more than 600 different product standards. Pactech provides North American jumper power cords with the certified UL mark. As a matter of fact, Pactech’s IEC 60320 cords have different multi-rated approvals on power cords for use in multiple countries. Different types of plugs and connectors are specified for different combinations of required current, voltage, and temperature. Pactech carries 11 combination types of plugs and connectors that generate a range of currents from 10A to 20A with different gauges to meet your needs in any data center configuration. For example, IEC C14 to C13 North American cords are the most popular jumper power cords with our customers. We carry 10A, 13A and 15A in stock. For IEC C20 to C19 North American cords, we carry both 15A and 20A. As a professional supplier of power cords, we understand the importance of having a fitted length. Omitting unnecessary length not only creates a neat and organized look for the rack, but also gives more space for better airflow. Our general length selections for jumper power cords are 1 ft, 2 ft, 3 ft, 4 ft, 5 ft, 6 ft, 7 ft, 8 ft, 9 ft, 10 ft, 12 ft, 15 ft, but any required length may be ordered. Various colors help server rack configurations greatly by offering clear identifications of cords, which ultimately shorten the installation and maintenance time and costs. Pactech offers 5 colors for all IEC 60320 jumper power cords: Black, Blue, Green, Red, White. We proudly offer the option of customizing the exact type of IEC 60320 jumper power cords based on non-standard desired colors and lengths. Please refer to our online configurator for a quote of your desired power cords here. Pactech offers multiple optional services to ensure the best shopping experience for our customers. As Pactech has 4 global distribution centers, we have the logistic flexibility to welcome customers from all around the world. Please see the following examples of the services we offer. 1. Labeling and Bundling Services We offer single label (or multiple labels) per cord and/or per bundle. 2. Special Packaging and Shipping Services We encourage your special packaging and shipping instructions. 3. Drop Ship Service To ensure shipment efficiency, we offer the option of drop-ship service from our factory to the end-user. 4. Variety of shipment methods Different shipment methods such as Local Delivery, Will Call, and Just-In-Time (JIT) are available with Pactech for all domestic and international customers.